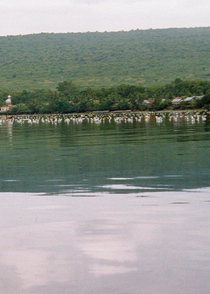 The coastal settlements of Kolowa-Wadiobero have a long history of supplementing livelihoods with marine based activities. Fishing, reef gleaning, and long distance maritime trade are important elements of the local community economy. Following an assets mapping exercise in 2004, the idea of bulk marketing locally produced seaweed emerged as a potential community enterprise. High costs of transport and low margins constrained production of the seaweed that is produced beyond the beachfront in shallow coastal waters. In early 2005, with support from local NGO Sintesa, a community enterprise partnership group (Kelompok Mita Usaha Masyarakat) of seaweed producers was established. The group of 55 members established a savings and loan component and set about negotiating the purchase of seaweed and sales agreements with local traders. The enterprise met with early success. Between start up in January 2005-June 2006 the cooperative made 23 bulk sales (boatloads) of dried seaweed to traders in the district centre Bau Bau, a 30 minute boatride to the main island. Starting from nothing, the cooperative made a working profit after costs of around $AUD1,500. The income included payment to the 3 person management group. In the process the group became the largest private seaweed marketing cooperative in the region. 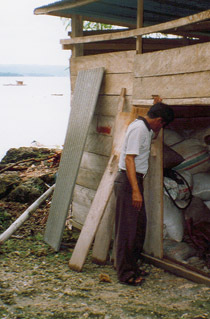 Producers don’t need to be a member to sell to the cooperative and the cooperatives decision to buy small amounts of dried seaweed (as little as 1kg) prompted a significant increase in local production, including by widows and poorer households who can now generate incomes on small levels of production. Members of the cooperative have access to a credit facility to purchase seaweed production equipment generated through their own savings and with funding support from their local community bank, KSU Syukur Jaya which provides low cost credit to member enterprises. An example was the provision of a low interest loan to build a small storage facility for dried seaweed and to make initial bulk purchases. The inital success of the cooperative highlighted both the economic potential of the seaweed production in the area and the opportunities for cooperative marketing. But there remain a number of challenges to sustain and grow the enterprise. Bookwork and financial administration needs to be professionalised. Storage and seaweed processing techniques also need to be improved along with better marketing efficiencies. Nevertheless the achievements of the group have given local householders confidence in their ability to improve local livelihoods through ethical community enterprise.